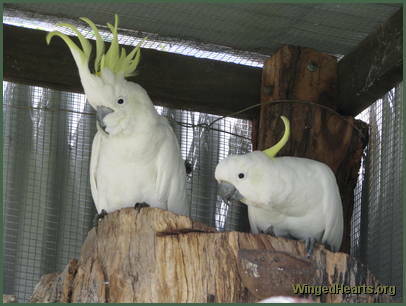 Charlie Boy and Mickey (girl) enjoying their favourite stump in the spacious aviary at the Long Grass Nature Refuge. Charlie had spent over 55 years in a cage which caused his feet to become permanently cramped. His wing muscles have also atrophied and he's unable to fly. Mickey could fly away and does fly into the trees when out on walks (flights), but always returns to the love of her heart Charlie Boy. She will not leave him and go even though she is free, such is the loyalty and bond between these birds. Charlie Boy takes great pleasure in walking around the strategically placed logs. This enables him to enjoy a life in the trees even though he can't fly. Mickey is always nearby so her sweetheart is not alone. 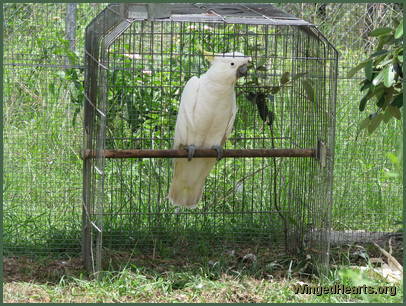 Crock and Irene had spent 35 years in separate cages similar to the one shown below. They were considered unhandleable, vicious and aggressive when surrendered by their owners. Crock left the cage within minutes to enjoy more space in the aviary and has never returned since. Within days he became a bright and cheerful personality, happy to have his head scratched and grateful to the humans (Pete and Gabi) who understood his needs. Irene was caught and trapped when she came down to see Crock. Little did she know that she too would be subjected to 35 years of imprisonment in a cell this small. Here the bottom and sides have been cut off to let the birds out. 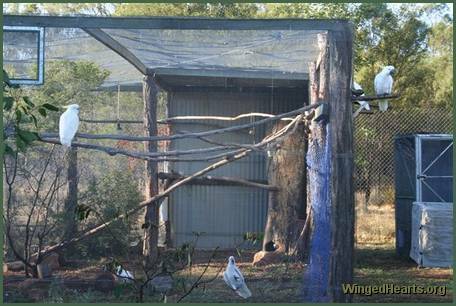 As they are new to the rehabilitation centre, the open cage has been left in the aviary in case the birds want some sign of their old home for comfort. 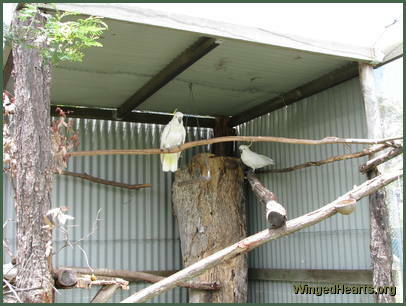 Within days Crock and Irene have made friends with the other birds in the aviary and are enjoying discovering the nooks and hollows in the natural based aviary. 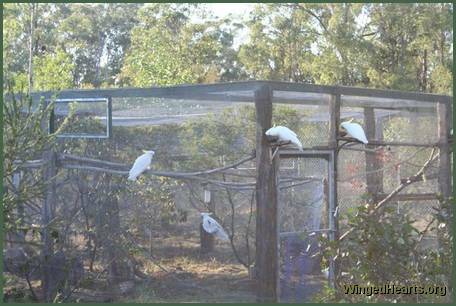 Another view of the birds in the generous aviary, where they can also wander outdoors when comfortable.